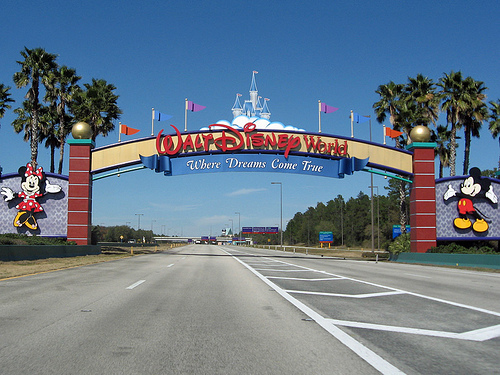 Looking for something to do on your Disney World Arrival Day? Discover your resort. There are swimming pools, game rooms, restaurants and more at each of the Disney resort hotels. You’ll also find activities for the family to enjoy such as outdoor movies, renting bicycles, carriage rides and more! 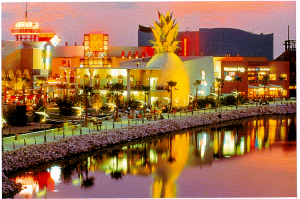 Take a trip over to Downtown Disney. Enjoy some shopping, grab a bite to eat, get tickets ahead of time for Cirque du Soleil’s La Nouba. Head over to Disney’s Wilderness Lodge for a Campfire Sing-A-Long with Chip and Dale. Take a ride on the monorail and discover other resorts. Hop on another monorail line and cruise on over through Epcot. End the evening on the beach of Disney’s Polynesian Resort and enjoy Wishes over the Magic Kingdom. What about a stroll along the boardwalk – Disney’s Boardwalk Inn that is. You’ll find dining, drinks and entertainment for the entire family. 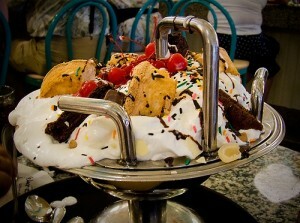 Visit Beaches and Cream at Disney’s Beach Club Resort. Let the group share a “Kitchen Sink”. Finally – Turn in early! If you get to bed early you’ll be able to rise early and hit the parks for rope drop. First ones through the gates experience less wait times for rides and attractions and during warmer months they’ll enjoy cooler temperatures. Ask your Authorized Disney Vacation Planner at MickeyTravels for details on these activities and more. They’ll help you with a plan that will create a magical vacation for everyone in your family! 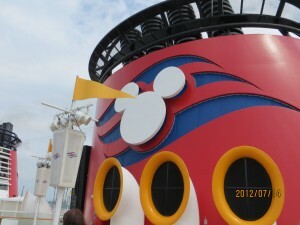 Okay, so I’d be a mouse-eared liar if I didn’t admit how excited Jenn and I were to tour the Disney Magic Cruise Ship this month. It’s in New York for the final itineraries to Canada and the New England Coasts and we were lucky enough to be invited to tour with other travel professionals. Knowing that the Magic is the number one rated ship in the world, and with the legendary “Disney Difference” in hand, we expected to be blown away by the ship from the moment we stepped onboard. We were SO not disappointed! First things first, which means we need to actually back up to BEFORE the ship first. Jenn and I were kindly chauffered to the port in New York by my awesome brother (he’s a Jersey-ite, so he navigates the streets of Manhattan WAY better than these Pittsburgh girls would’ve). The Disney Magic cruise ship was sharing an entry with another cruise line, and when we first entered the terminal it was easy to spot where we wanted to be — there were white Mickey gloves waving all over the place to let travellers know which way to go. Seriously, for every one “other” employee, there were at least four or five Disney employees. In no time at all we were checked in for our cruise tour and seated in the well-organized, spacious lounge area. There were some great photo opps around for families to take advantage of while they were waiting to board on that day’s cruise, and spirits seemed high. The check-in line moved smoothly and soon we were surrounded by happy, friendly people who couldn’t wait to get onboard. Lucky for us, being tour visitors, we were first. The main lobby, which is where everyone enters the ship, was lined with smiling ship employees who welcomed us all as we boarded. We had a FANTASTIC tour guide who told us that we were going to check out the staterooms first, then move on to dining and recreational facilities. So up we went to the higher decks to check out some truly amazing staterooms. 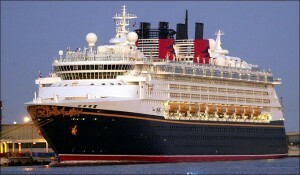 Starting with the crown jewel of staterooms, the Roy O. Disney suite. In one word? I can’t even try. Beautiful, luxurious, plush, opulent — I could go on but there’s so much more to talk about! 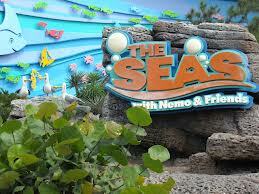 Climb aboard a “clam-mobile” and join an underwater adventure in “The Seas With Nemo and Friends”. Nemo has wandered off again and you are on a journey to find him. Encounter all of your favorite characters such as Dory, Crush and Bruce along the way. The musical finale combines animation along with the amazing Seas With Nemo and Friends aquarium as the backdrop. Experience Nemo and his friends as they swim among live fish in the 5.7 million gallon tank. Located in Epcot’s Future World, this slow moving attraction is suitable for guests of all ages and will transport you to a colorful world under the sea. 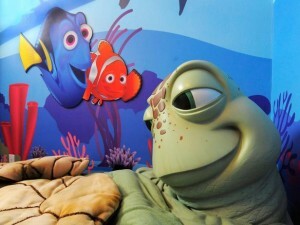 The fun continues after the ride with many other activities involving Nemo and his friends inside the pavilion. Be sure to check out Turtle Talk with Crush and Bruce’s Shark World as you explore.